birthstone jewelry, the best gift for Mom! Our Swarovski ® birthstone jewelry is the perfect gift for your children wear close to your heart. Each month has its own birthstone, where you can make it even more personal piece of jewelry with an engraving of birth and name. 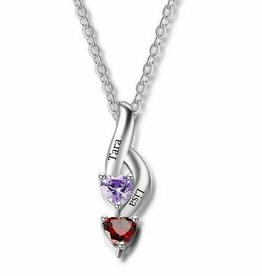 View the beautiful collection of birthstone pendants and necklaces, all in sterling silver so forever beautiful. Whether you have one child, or for grandma creates a native stone jewelery for all her grandchildren, anything is possible. Gorgeous necklace with a beautiful shiny graveerbedel and freshwater pearl. Hand we engrave a name, date or word choice. By-and-by .925 silver, forever beautiful. Gorgeous .925 silver necklace with 'Tree of LIfe charm', engraving bed and Swarovski® birth crystal. We can optionally dig a name, word or date and finish it with a beautiful crystal that refers to the birth month. Beautiful necklace with heart-shaped pendant. 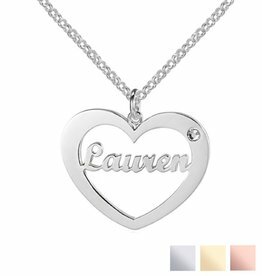 Extra personal by the name of your child and birthstone in the jewelery. The perfect gift for any mother! 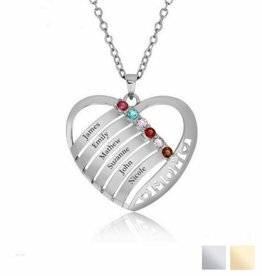 Wear your family forever close to you with this beautiful heart-shaped necklace with 6 names and birthstones. A wonderful gift for any mom or grandmother. The birthstone jewelry is often given to the brand new mommy to celebrate the birth of a sweet miracle. 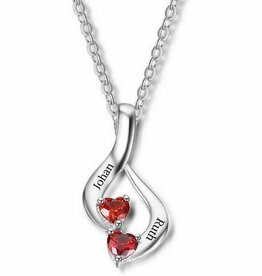 A mother necklace containing the first name of her child, a Swarovski crystal which symbolizes the birth month, and even a date. This elegant birthstone jewelry she wears every day is and will cherish them. 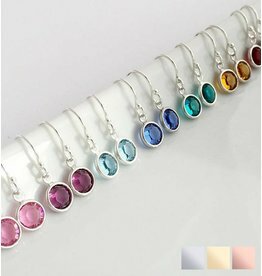 All our birthstone necklaces are manufactured of .925 silver and some with real gold plated, so they will last a lifetime. So you get a tangible reminder of the birth of the little miracle. Sure the mother will be softened at the sight of this beautiful piece of silver jewelry made especially for her. The first use of Birth stones in jewelry started in the 15-th century in Poland. Priests processed twelve stones in headdresses to symbolize the twelve months. The first list of birthstones was then published in 1912 by the Jewelers of America. The stones were designated on the basis of color, each month, such a color. Now birthstones joyfully used in jewelery, where KAYA only the highest quality Swarovski ® birthstones works. Besides giving the symbolism of these beautiful crystal birthstones that extra 'bling' to your mother's jewelry, is precisely why they are such a popular baby shower gift for moms and grandmas who subtly can help her family with her. Stone name is derived from the Latin 'granatus "meaning seed. The stone was worn as a talisman by warriors and knights. Armor also were decorated with garnet. This beautiful stone vilette means "not intoxicating, not under the influence" and takes its name from the Greek god of wine Bacchus. He was in love with the nymph amethyst, but they felt no affection. For him to get rid amethyst asked God to help Diana, who pronounced her enchantment if Bacchus touched her, she turned into a stone. The diamond is the most famous rock and is also called the "Star of Africa". The name diamond is derived from the Greek adamas, which means invincible. The stone was known for its healing effect on diseases like this wore during the night. Cleopatra was completely in love with this stone. In ancient Egypt believed the Incas and the Aztecs that this stone had clairvoyant powers. If you take the stone a long time helped you, you could clearly see the future. Because of its shape and inscrutable luster true pearl in many cultures as a symbol for eternity, weisheid and beauty. Pearls are formed in oysters and consist of 100% nacre. The Romans believed that the pearl of wisdom and strength gave, and that would get the bear happiness. The ruby is considered the most precious stone. By the beautiful color it is known as the symbol for passion and love. In addition, the ruby protects against misfortune and gives you courage. Peridot is the stone of the sun, as the Odue Egyptians called it. The stone was known to provided the wearer self-confidence, happiness and strength. The yellow-green stone was extremely popular with Cleopatra, who thought she could thus counteract the aging process. The blue color of the stone refers to the sky and it was thought that it gave protection against vergifiting. Also curative effects were attributed to the stone, such as blindness and arthritis. The colorful opal stories do the rounds, but the best known is that of the Aborigines in Australia. Creator, a god came through the Rainbows on earth. Wherever he put down his feet, opals were formed a rainbow glow entailed. They say that makes the topaz intelligent women, fertile EMN happy, at least so say the legends. The Romans and Greeks associated the red stone with the gods Zues and Jupiter, which gave them the support force. On the Turquoise attributed most of the powers of all birthstones. In particular, numerous medicinal effects have been described in the history. That is why you find this stone back in talismans and amulets that people were carrying.